Yesterdays Modern & Post-War British Art Evening Sale was led by Sir Stanley Spencers monumental Christ Preaching at Cookham Regatta: Punts by the River, depicting a divine vision of a regatta in his native village. Appearing on the market for the first time since it was acquired in 1959  the year after it was painted  it sold for £3,370,000. Courtesy Sothebys. LONDON.- This Summers Modern British Art Week at Sothebys showcased spectacular works by a roll-call of Britains most pioneering artists, from masterpieces of mid-century modernism to the avant-garde Colourists and dazzling works on paper from the collection of Howard Hodgkin. Across two days and four sales, 221 lots sold to bring £20,632,000 / $27,539,593 (est. £15.4-23.6 million). Yesterdays Modern & Post-War British Art Evening Sale totalled £12,367,500 with a robust sell-through rate of 81%, followed by todays Day Sale result of £2,562,625 and over 90% of lots finding buyers. The auction was led by Sir Stanley Spencers monumental Christ Preaching at Cookham Regatta: Punts by the River, depicting a divine vision of a regatta in his native village. Appearing on the market for the first time since it was acquired in 1959  the year after it was painted  it sold for £3,370,000. Works spanning four decades of Ben Nicholsons oeuvre were highly sought-after across the sales, led by the magnificent large-scale relief 1966 (IOS) at £1,210,000. Table-top composition, July 1960 (Green and Black), which takes the most traditional of genres and makes it unabashedly avant-garde, achieved a triple-estimate £406,000, whilst the jewel-like drawing 1940 (Gouache) also tripled its estimate to make £187,500. Outstanding sculptures by contemporaries and friends Dame Barbara Hepworth and Henry Moore also performed well, as Hepworths beguiling alabaster Spiral from 1959 brought £1,270,000 and Henry Moores kinetic and deeply personal Rocking Chair No. 2 sold for £910,000. Further highlights included William Roberts bustling and optimistic vision of a Post-WWI Barbers Shop, which sold for more than a snip above estimate at £406,000, and two monumental canvases by William Scott both making their auction debuts from important Irish collections, with iridescent Berlin Blues 2 at £730,000 and rich ochre Dark Earth Scheme at £430,000. Sir Winston Churchills paintings are a moving insight into his off-duty life as a father, husband and friend, telling the story of his travels. The selection was led by A view of Eze in the Alpes-Maritimes, a majestic hill top town that he visited frequently, which soared to £514,000. 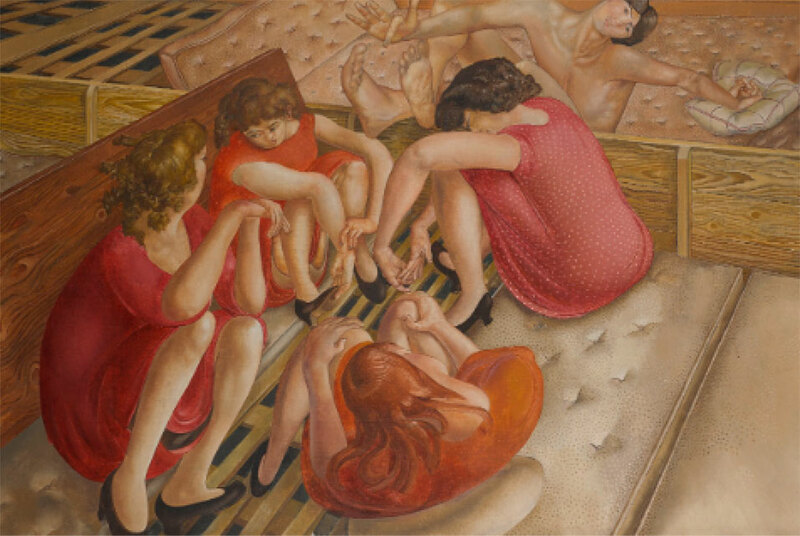 In the Day Sale, two works from the collection of his granddaughter, the late Arabella Churchill, brought a combined £237,500, proceeds of which will benefit her charity Childrens World. Revealing the scope, diversity and ultimately the great passion Hodgkin had for working on paper, this weeks sale of Artists Proofs and drawings from his personal collection captured the imagination of bidders worldwide. All but two of the 89 lots offered sold, with 90% of these soaring above their pre-sale high estimates to bring a double-estimate total of £1,184,500 (est. £474,400-695,600). The proceeds will fund a complete museum collection of Hodgkins graphic work that is fully accessible for the public to see and enjoy, as well as supporting a new edition of the artists Catalogue Raisonné, which will feature 189 prints and many unique works on paper. The selection was led by the recently rediscovered hand-painted gouache Indian Waves No. 32 at £87,500, whose sweeping tides of colour and gesture were inspired by the coastline of India. A further unseen work from the series, Indian Waves No. 31, sold for £43,750. Hodgkin was one of a handful of leading British artists invited to design the official Olympics posters, and the sale offered both the original artworks for a number of these as well as prints. Just as an Olympic athletes physical performance appears effortless and graceful after countless hours of training and preparation, Hodgkins seemingly spontaneous artworks are the result of almost 60 years of dedicated work. The sumptuous deep blue Swimming made a splash at £60,000, and the explosive but concentrated Ice brought £32,500. Hodgkin both loved and knew a great deal about the performing arts, with a true love of Beethovens music. Sold to benefit the Royal Opera House Covent Garden Foundation, Hodgkins exuberant Back Cloth Design for Piano in 1989 doubled its estimate to bring £68,750. This was followed by his original costume design for the same production, which sold for £2,250 against an estimate of £200-300. Yesterday at Sothebys in London, a new auction record was established for F.C.B. Cadell, the Scottish Colourist, when his painting Reflection from 1915 sold for £874,000. The painting was the top lot in a sale of a group of over 30 pictures which formed one of the most exceptional collections of Scottish Colourist works in private ownership. Together, they brought a combined total of £4,517,375, exceeding pre-sale expectations. The moniker Scottish Colourists was coined in 1948 for the group of four artists  Cadell, Peploe, Hunter and Fergusson  who were arguably the most avant-garde British artists of their day, the spark of their artistic inspiration found in Paris at the turn of the 20th century. The Harrison Collection was assembled in the 1920s and 1930s by Major Ion Harrison, an important patron and close friend of the artists. Passed down through the family, the works had remained together until recently at Croft House, Major Harrisons home where he openly welcomed the Colourists. The sale saw strong prices for Cadell  The White Room, also painted in 1915, commanded an above-estimate £670,000, while The Pink Azaleas, painted a decade later, made £394,000. Works by Samuel John Peploe performed well, led by Trees, Antibes and Michaelmas Daisies and Oranges which sold for £586,000 and £490,000 respectively.